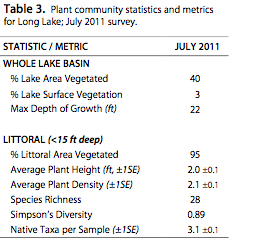 In 2011 the Long Lake Area Association commissioned a study of plant life in Long Lake. They hired Freshwater Scientific Services and the lake was surveyed by James A. Johnson, Aquatic Ecologist. Freshwater Scientific Services, LLC completed a whole-lake survey of the plants in Long Lake on July 25 and July 26, 2011 using the point-intercept method described by Madsen (1999). This survey incorporated assessments at roughly 500 sample points (328 littoral, <15 ft) arranged in a grid across the lake (300-ft interpoint spacing, Figs. 3 and 4). We generated these sample points using desktop GIS software, the MDNR Random Sample Generator extension, and aerial imagery of the lake. We then loaded the sample point locations onto a handheld GPS unit (Garmin GPSMAP-78) to enable navigation to each point while in the field. At each designated sample point, we sampled plants using a weighted, double-headed, 14-tine rake attached to a rope. To ensure that each sample collected plants from a consistent area of lake sediment, we dragged the rake (13 inches wide) approximately 10 feet along the bottom before retrieving. For each rake sample, all of the retrieved plants were piled on top of the rake head and assigned density ratings from 1 to 5 based upon rake coverage as described below. Density ratings were assigned for all plants collectively (whole rake density) as well as for each individual plant species retrieved on the rake. 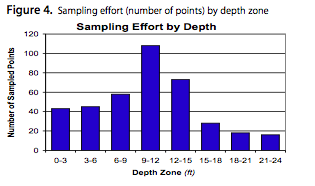 Additional species that were observed growing within 10 ft of a sample point but not retrieved on the rake were given a rating of zero for that site. 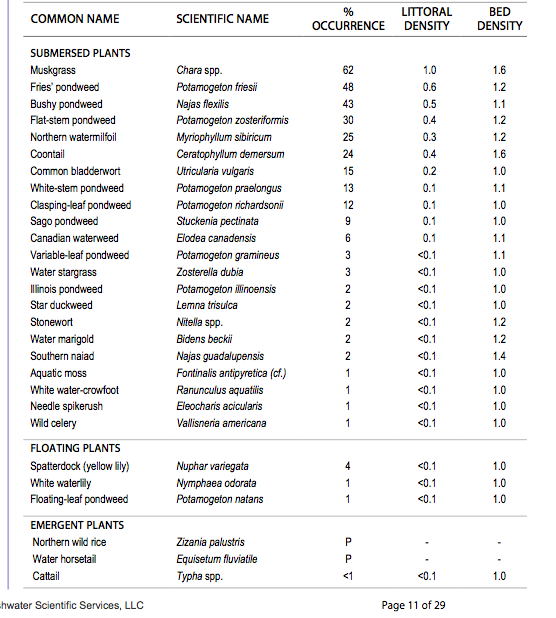 These “zero” species were included in the final species lists and distribution maps, but were not included in the calculation of plant community metrics and statistics. A total of 28 aquatic plant taxa (most identified to species; hereafter called “species”) were found in Long Lake in 2011 (Table 2); 22 submersed (underwater), 3 floating, and 3 emergents (extend out of water). Shoreland plants were noted as present when observed near the sampled points, however we did not conduct an intensive shoreland plant survey in 2011. The report stated that Long Lake is typical of most lakes in Northern Minnesota. The report goes into detail for 8 major species with pictures and a description. Also included is information on how to manage each plant species. Most of the plants in Long Lake do not seem to be ones we need to manage in any aggressive way or need to be concerned with in the near future. The next part of the report contains several pages of plant density maps for each of the major species. The results presented here show that Long Lake supported a healthy, abundant, and diverse aquatic plant community in 2011. The wide range of plant growth forms we observed surely provide abundant and varied habitat for fish and wildlife and offer many other benefits to the lake. Furthermore, we did not find any invasive aquatic plants or substantial areas of nuisance native plant growth. This combination of abundant and diverse native plants, no invasives plants, and low nuisance growth of native plants is nearly ideal. Many lake associations spend a substantial amount of their time and money trying to achieve this condition – often without success. The LLAA should continue to protect the aquatic plant community of Long Lake and promote the value of the lake’s plants to association members, lake users, and local decision- makers. (1) Conduct a point-intercept aquatic plant survey of Long Lake at least every 5 years (or more frequently if intensive management is planned) to track any changes and identify emerging threats to the lake’s healthy plant community. (2) Conduct annual early-detection “sentinel” surveys (visual, near-shore surveys) for invasive, non-native aquatic plants – namely curlyleaf pondweed and Eurasian watermilfoil. This would greatly improve the chances for detecting a new invader soon after it arrived. (3) Develop or update an Early-detection & Rapid Response Plan for invasive, non-native species. (4) Promote appreciation of the high quality of the plant community in Long Lake through educational materials, newsletters, and interpretive signage. (5) Educate lakeshore homeowners on how to responsibly manage aquatic plants near their shoreline." For those members interested in reading the full 29 page report, it can be found by clicking on this link: Long Aquatic Lake Plant Survey Report. The Long Lake report is the second one down on the list.